For updates throughout the year to the School Calendar, please visit our Calendar Page. The uniform policies of Maharishi School have proven successful in helping to culture a quiet form of orderliness and coherence in the classroom. Please review the School’s uniform guidelines (see links above) with your child so that you are both aware of the current uniform requirements. Please label all uniform items with the student’s name. 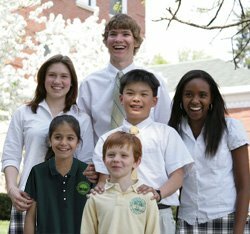 Lands’ End is now the sole provider of our School uniforms with the exception of 1-12 shoes, and 7-12 ties. Unless otherwise indicated, all items listed below can be purchased from Lands’ End. To order items from Lands’ End, go to Maharishi School’s Lands’ End page. Step 1: Go online to landsend.com/school. You may order from Lands’ End by phone at 1-800-469-2222. For your convenience, some sample sizes of uniform items are available for try-on in the Central Office. Please contact the Central Office at 641-472-9400, ext. 2 to make an appointment for try-on or with any questions you might have.